“Step 1: I analyzed the situation fearlessly and honestly and figured out what was the worst that could possibly happen as a result of this failure. Step 2: After figuring out what was the worst that could possibly happen, I reconciled myself to accepting it, if necessary. Step 3: From that time on, I calmly devoted my time and energy to trying to improve upon the worst which I had already accepted mentally. Did the Depression ever leave? Stock market investors, however, are far from accepting the worst. The weekly leading indicators from the ECRI are indicating the start of a new recession. This meshes with the 2yr Treasury Note hitting all time highs. When the bond market diverges from stock market sentiment (this also happened in the summer of 2008), we side with the bond market. Especially, when a flat yield curve means less profits for the banks. With new home demand hitting record lows and negative equity in mortgages already larger than the TARP funds, we are faced with a Depression. The IMF is already warning U.S. banks may need $76 billion in additional capital. And this is at the start of a downturn! On the edge of the precipice in September of 2008, we started looking for possible bargains (Crash Opportunities Part One and Crash Opportunities Part Two). Here we are again. So as the U.S. hits an “invisible wall”, we found something very interesting going on in China. On March 31st, we concluded that the Chinese real estate bubble was likely heading south. And now, as the WSJ reports, the average Chinese property price has declined in June for the first time in 16 months. While we described what is likely to eventually occur to the Chinese financial sector, we note that the U.S. stock market continued upwards for two years after the U.S. housing market peaked. 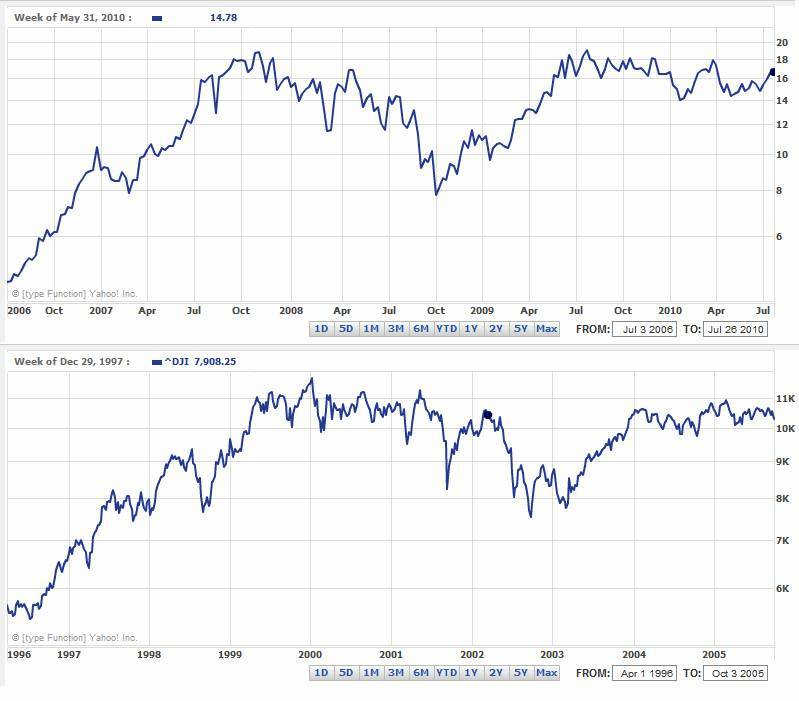 We would also like to point out the price similarities of Chinese property investment companies and the Dow Jones Industrial Average leading up to 2005 (see example below). As we all know, the DJIA soared as the real estate bubble shifted to a stock market bubble. Could this happen again in China? Sure. Interestingly, China is now considering selling real estate investment trusts. The U.S. REITS were big performers in 2005 and 2006 even after residential prices had peaked. But they were also huge losers in 2008 as the Vanguard REIT ETF lost over 70%. So if you are trading in the Chinese markets, be sure you don’t get shanghaied. “It is true that cash has lost purchasing power in this country but fortunately in our lifetime at a very slow rate compared to the rapid depreciation that can be suffered in a real stock market decline.” - Gerald M. Loeb, The Battle for Investment Survival. 1935. The consumer price index is following money supply growth down. For investors sitting in cash, your funds can buy more. “Investing solely for ‘income,’ investing merely ‘to keep capital employed,’ and investing simply ‘to hedge against inflation’ are all entirely out of the question.” - Gerald M. Loeb, The Battle for Investment Survival. 1935. Last February, we presented the Crash of 1987 chart. Specifically, we compared our current market to that of the October peak. Even with the Flash Crash in May, the market is still acting like it wants to crash. While bear markets can be extremely volatile, we continue to expect a Second Flash Crash. We guess when you have bet your whole institution on one investment class you better feel ‘extremely comfortable.’ Instead of following the herd, investors should be avoiding municipal bonds as well as any institution that is overloaded with municipal securities. “Successful investment is a battle for financial survival.”- Gerald M. Loeb, The Battle for Investment Survival. 1935. "What the Fed has done is eventually going to help turn things around, but people don't believe it yet," said Gary Webb, CEO at Webb Financial Group. "They're acting on fear." "Fear is feeding upon itself and nothing the officials have done to this point seems to stem the tide," said Ryan Atkinson, market analyst at Balestra Capital. "Central banks of the world have been flooding the markets with liquidity, but banks are hoarding cash," Atkinson said. "This is the lynchpin of the entire financial system and as long as this is still going on, the markets will be driven by fear."